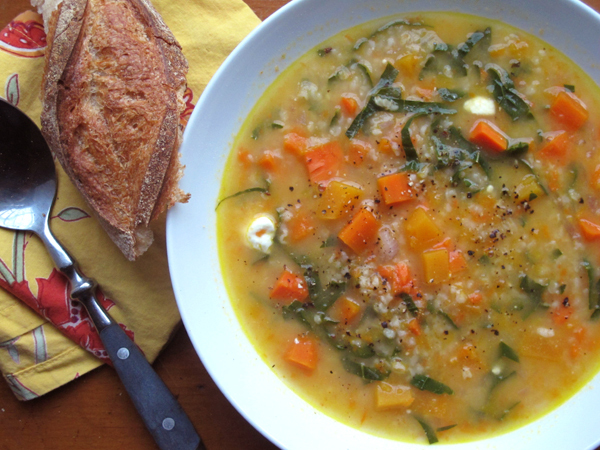 Well, it’s soup weather! Fall entered New York in earnest last week and I’m pretty happy about it, because this is my absolute most favorite time of the year to cook. Late summer is great for eating fruit and veg out of hand while you walk home from the farmer’s market, but fall gets the balance right in terms of there being both good produce, and just enough chill in the air that standing over the stove is the best spot in the house. This past weekend, after an afternoon strutting around my neighborhood wearing my favorite hoodie, I got very eager to make soup. And that could be any kind of soup I please, not just cold soup. A long time ago my friend Bob spoke—gChatted—rhapsodically about the Quinoa Chowder with Feta, Spinach, and Scallions in my favorite vegetarian tome, Vegetarian Cooking for Everyone. I still hadn’t made it, but it was exactly the kind of thing I wanted to usher in the new season. The only problem is that I didn’t have very many of the ingredients. So I improvised, as one does, with what I had on hand. Bulgur, an increasingly favorite quick-cooking grain of mine, in place of the quinoa. Kale for the spinach. And then there was half of a butternut squash and a crisper with a few carrots, which prompted me to take this soup in a sweeter, dare I say more autumnal, direction. The feta is what makes it special, though—and it may also be what makes it chowder, not just plain old soup—by giving things a surprisingly tangy finish. I used a combination of carrots and butternut squash here, but next time I’ll stick only to the squash. 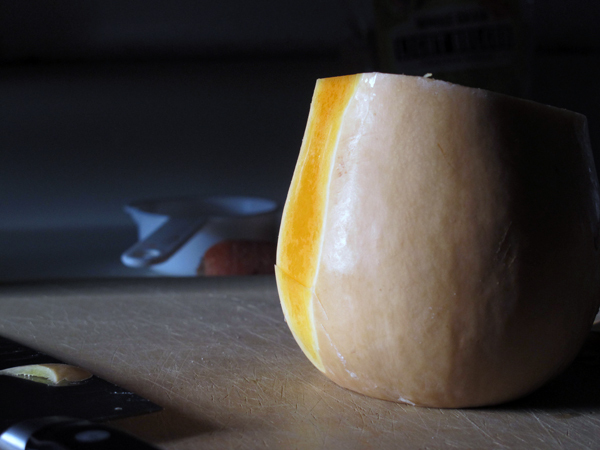 The carrot never loses its fibrous edge, and I prefer the flavor of the squash. 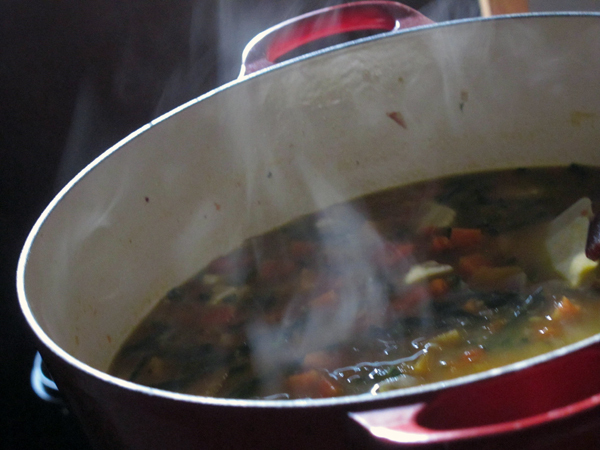 One brilliant thing about this soup is that you make your stock from the grain cooking water. Besides being a refreshing, time-saving, and fairly unusual step, it saves me from having to prosthelytize about all the merits of homemade vegetable stock (and I’ve been slacking anyway—there’s a jar of Better than Bouillon in my fridge). So this hearty chowder actually comes together in 45 minutes to an hour, doesn’t take shortcuts, and tastes like more than the sum of its parts. That’s all I ever want out of soup anyway. 1. Combine the bulgur and water in a soup pot. Bring to a boil, then reduce the heat and simmer for 10 minutes. Drain the bulgur, but reserve the cooking water. Set the bulgur aside. Pour off all but 5-1/2 cups of the water, or if there happens to not be enough, just add tap water to make 5-1/2 cups. (The best way to streamline this step is to strain through a sieve that’s been set over an 8-cup liquid measuring cup.) Meanwhile, chop your vegetables. 2. Wipe out the soup pot if there are any remaining pieces of bulgur. Heat the oil over medium heat. Add the onion and squash and sauté for about 5 minutes. Add the garlic and cook until fragrant, about 30 seconds. Turn up the heat, stirring constantly until sizzling, then deglaze the pot with the wine. After the wine is reduced by half, after 2 or 3 minutes, pour in the reserved bulgur cooking water. Bring to a boil and add the salt. Reduce to a simmer and cook for 15 to 20 minutes, until the vegetables are tender. 4. 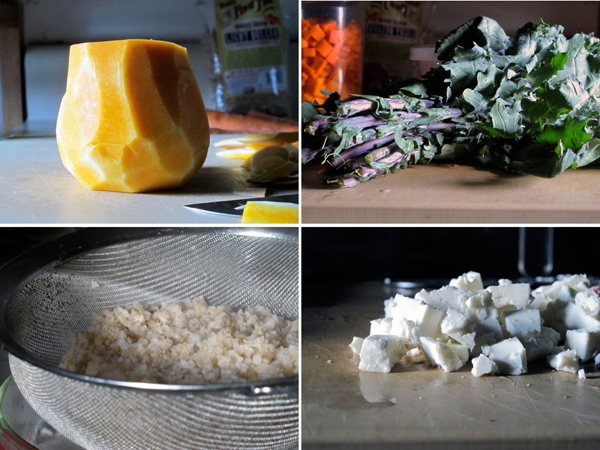 Return the soup to medium heat and stir in the kale and the cooked bulgur. Simmer for about 5 minutes more, until the kale is tender. Remove from the heat and stir in the feta. Add many grinds of black pepper, taste carefully for seasoning, and serve. Fall is by far my favorite time of year too, it’s just taking a while arriving here in BC, this year. Def. going to make this. Looks delish. Kale, feta, and butternut squash are three of my favorite things: This is going to be in heavy rotation in the Nervous kitchen this fall, I’ll bet.